Staple Hill Primary School is an inclusive community. We aim to help all children to succeed and to remove any barriers to learning. We receive Pupil Premium funding to make sure that those children who are eligible for Free School Meals achieve at least as well as all other children. Details of how we use the Pupil Premium to help children can be found here. 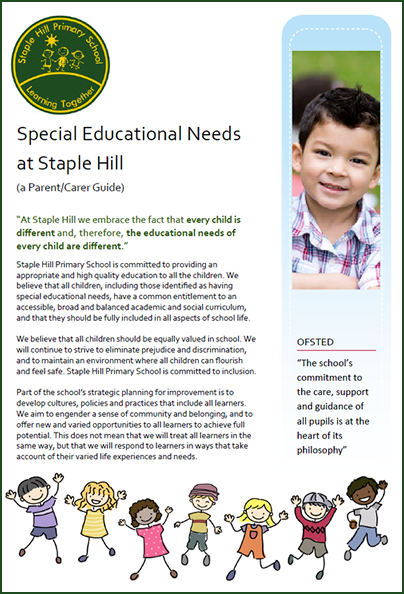 All children who apply to Staple Hill are admitted without prejudice and in accordance with LA admissions for providing placements for children with SEND. Our new school has been built to allow children and carers with disabilities access to all areas of the school. Access points to the school building are on flat surfaces with wide doorways. There is a lift to reach the first floor. There are disabled toilet facilities on both the ground and first floor. The school has an accessibility plan, a copy of which can be viewed here or obtained from the school office . The SEND and Inclusion policy can be viewed here or obtained from the school office. If any parent/carer, or any other person involved directly with the school require a specific service or information (in any format), then we will endeavour to meet these needs, wherever possible. If you need support in translation of documents then please notify the school and we will do our best to accommodate you. Printed copies of all documents are available from the school office on request. The SEND & Inclusion Leader at Staple Hill Primary is: Mrs S Boult. If you have any concerns or would like to talk to Mrs Boult please contact her via the school office. For full details of what we offer for children with special educational needs and disabilities can be seen below.